Perhaps the best thing state legislators could do for Michigan moms would be to allow more educational options for children — at least according to the latest poll from the Friedman Foundation. Mothers polled supported all varieties of school choice, including providing students with resources to attend public, private or religious schools. Mothers of school-age children were surveyed by phone and asked whether they supported specific school choice programs. Nearly 70 percent of moms said that they support tax credit scholarships for students. When asked about school vouchers, 66 percent of surveyed moms said that they supported them, with just 26 percent opposed. Mothers were much more supportive of vouchers than people who do not have children. Among different demographic groups, low-income earners and African Americans were some of the most supportive of school vouchers. Moms also support universal eligibility for school choice: Two-thirds of surveyed moms support providing vouchers to all students, while just a third support limiting eligibility by income level. Young adults and African Americans were the demographic groups that were most supportive of universal eligibility. Republicans and independents were also supportive, while Democrats were less so. It's hard to miss the educational establishment's fear of giving parents more control of where to educate their children. After all, public school officials started a lobbying organization with taxpayer money in order to oppose similar school reform measures. And officials have a vested interest (to put it bluntly, a paycheck) in preserving the existing system. But instead of worrying about the educational establishment’s latest email blast, legislators should pay attention to the opinions of those that our public education system is truly meant to serve. 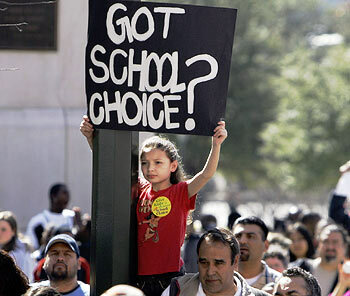 Overall, moms of school-age children are supportive of school choice. Why not give them and their children more options? Brunch and flowers are nice for Mother’s Day, but a more lasting gift would be one that helps moms’ kids attend a school that best serves their needs.